SINGAPORE - Singapore Post (SingPost) announced on Friday (Dec 14) that Mr Vincent Phang will be the new chief executive officer of postal services as well as its Singapore head, with effect from April 1, 2019. He will be replacing retiring Woo Keng Leong, who will serve as postal adviser to the SingPost group with effect from April 1, 2019, to ensure a smooth transition. Mr Phang, 45, is the current CEO of ST Logistics and Toll Group's executive vice-president of global logistics, which is a post he has held since 2013. Under his watch at Toll Group, the company has pushed forward with technology, with futuristic solutions such as automated goods movement and tracking on the floor in place at its relatively new logistics hub Toll City in Tuas. The five-storey, 100,000 sq m warehouse facility costs $228 million and opened officially at the end of July this year. Before his roles in ST Logistics and Toll Group, he was the director of manufacturing and supply chain, Asia Pacific, at BlackBerry for almost two years. Prior to that, he was the senior vice-president, corporate development, and general manager for aviation at ST Logistics from July 2007 to July 2011. 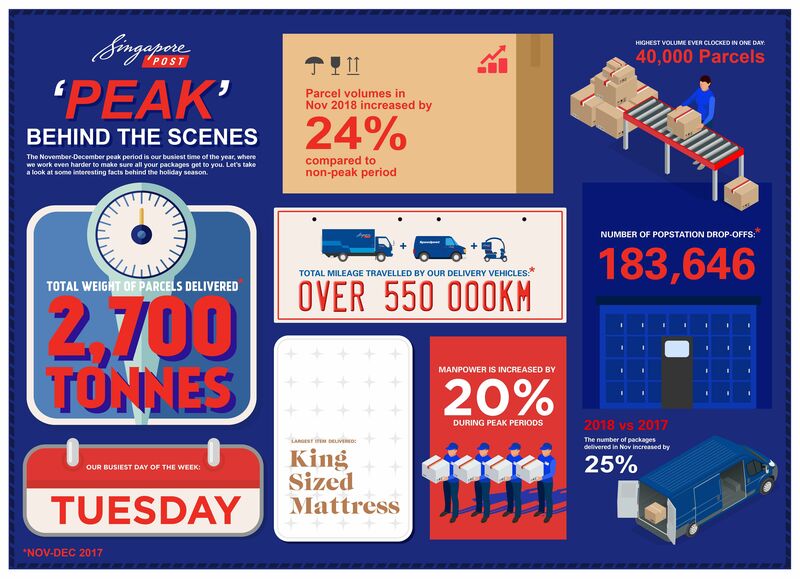 In a separate announcement on Friday, SingPost said that it saw a surge in parcel volumes during the year-end peak season, as a result of online shopping campaigns such as Singles Day, Black Friday and Cyber Monday. SingPost's courier subsidiary SP Parcels delivered more than 580,000 parcels locally in the month of November, a 24 per cent increase compared to non-peak months and a jump of 25 per cent year on year. To cope with the volume, SingPost said that SP Parcels increased staff manpower by 20 per cent while courier working hours were also extended by two hours during the period. Mr Freddy Chang, head of SP Parcels, said: "Over the years, we have seen steady growth in parcel volumes, as shoppers go online for the best deals during the festive season. These numbers represent just the tip of the iceberg, as e-commerce continues to grow in Singapore, as well as in the wider South-east Asian region."